Product categories of Traction Transformer, we are specialized manufacturers from China, Traction Transformer, Traction Rectifier Transformer suppliers/factory, wholesale high-quality products of Electric Traction Transformer R & D and manufacturing, we have the perfect after-sales service and technical support. Look forward to your cooperation! To meet the needs of development of railway electrification, We had successfully developed 110kV and 220kV YNV balance Traction Transformer, single-phase traction Transformer, three-phase Vv connection traction transformer and Vv connection traction transformer based on the special service conditions of traction transformer for railway electrification and by virtue of the technical advantages of the world`s highest voltage class-1000kV and the largest transformer capacity-1000MVA and the complete quality assurance system of Tianwei Group, the key technology including electric field, magnetic field, temperature field, fluid and leakage magnetic field and great support of customers. The products are featured by low noise, strong short-circuit resistance ability and high reliability. Our company will provide customers with excellent service. The new three-phase Vv railway traction transformer consists of two single-phase two-circuit transformers with independent magnetic circuit in a tank. The primary winding of two single-phase transformers are connected in series, the middle point of two ends and series wiring is taken as the input end of three-phase source, and the front and back ends of secondary winding of the two single-phase transformers are drawn out for Vv0 or Vv6, easy to use. The capacity of two single-phase transformers can be the same or different, and can effectively avoid the idle capacity of transformers. The transformer is the same as the single-phase transformer and the utilization rate can reach 100%. 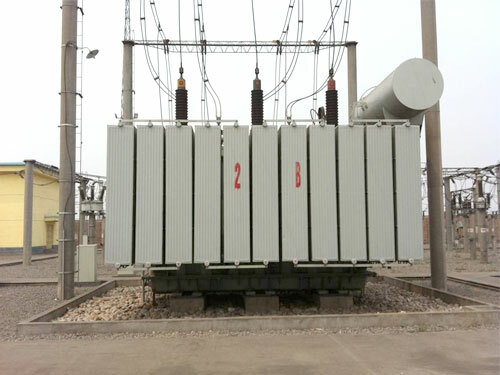 The single-phase transformer of new three-phase Vv railway traction transformer is core structure. It has low no-load loss and reduces more than 30% compared with the shell type structure. The three-phase Vv railway traction transformer has been developed by our company through mature short-circuit resistance technology. The corresponding measures are taken in the aspects of design and technology according to product features and the short-circuit resistance ability is promoted greatly. The overload capacity analysis software is developed according to the load curve provided by customers and relevant standards. It strictly complies with the relevant regulations, makes calculation and analysis based on the computing methods, meets customer demands, and owns a high degree of safety and high overload capacity.